*Recent ruminations from LUPEC Boston as originally published in the Weekly Dig. Did you know that ice is an American invention? Well, kind of. No one can claim ownership of frozen water, of course, but dropping a cube of it into beverages on a hot summer day was not such an easy luxury in the days before refrigeration. We can thank Frederic Tudor’s Yankee ingenuity for exporting the wonders of the ice-cold beverage to warmer regions of the world. A well-to-do Bostonian, Tudor dropped out of school at Boston Latin at age 13, spurning a college education at Harvard to pursue fortune in his own inventions. As the story goes, Tudor discovered his calling at 17 while seeking a cold beverage in Cuba without success. He decided then and there to create a business out of “harvesting ice” from the local New England ponds that freeze so solidly each winter. Tudor’s idea was at first met with ridicule but eventually grew into an empire. He sourced ice from familiar spots like Walden and Fresh Pond and shipped it around the world to Europe, the Caribbean, and even to the British East India Company in Calcutta. Tudor became known as Boston’s Ice King and died in 1864 a wealthy man. He even created an offshoot industry for Maine’s sawmills by insulating his precious cargo with the sawdust they’d previously thrown away. Let’s raise a glass to Tudor as the holidays – and the many parties that ensue – approach. 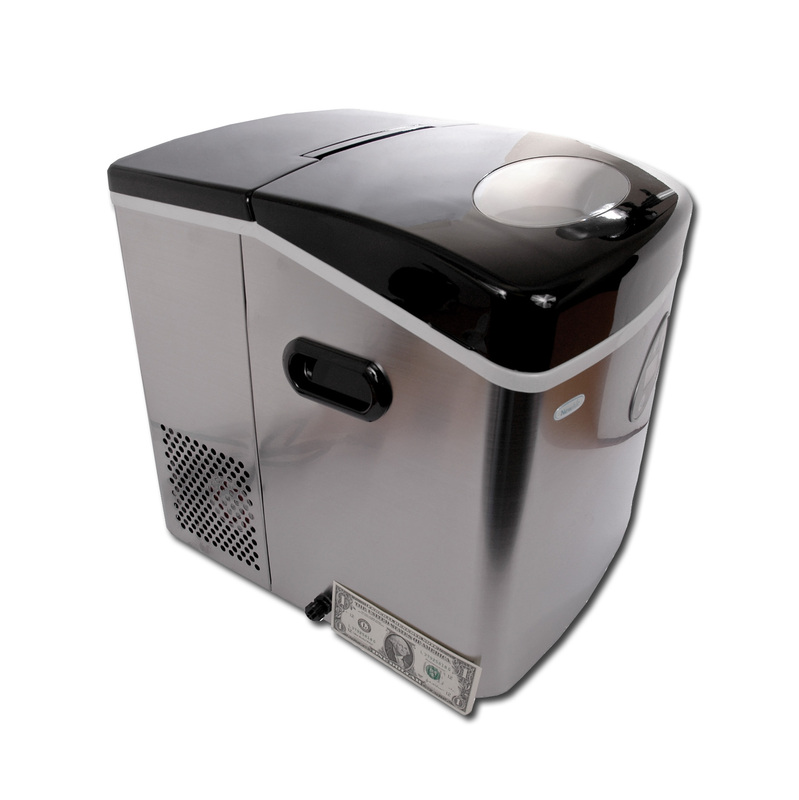 Several weeks ago, we LUPEC ladies got our hands on a special, modern invention that has satiated our high volume ice needs, the NewAir AI-100SS countertop ice maker from Air & Water. The kind folks in the marketing department offered us a chance to put this toy to the test. We’ve done so at several cocktail parties and found the machine to be true to its promise: it can make up to 35 pounds of ice per day and the first batch of ice cubes are complete in 15 minutes. Set-up and clean-up is delightfully facilement. You may rarely have need for 35 pounds of ice, and equally little use for the urn you bought that offers coffee service for 45. But if you do enjoy entertaining, or simply enjoy being totally prepared every single time you do, this kitchen gadget may be just the thing for you. Frederic Tudor would be impressed by how far we’ve come. Shake in iced cocktail shaker. Strain into a chilled vintage cocktail glass. A 7.0-magnitude earthquake; over 1.5 million left homeless; as many as 200,000 dead. The statistics flickering across the television screen nightly about the recent earthquake in Haiti seem improbably tragic, difficult to comprehend from the comfortable vantage point of a barstool. Restaurant industry colleagues have rushed to donate time and talent to raise money to support relief efforts: Via Matta and Radius will donate 100 percent of dessert sales, servers at Myers + Chang have been donating a portion of their tips, Stella did a mini-celebrity chef dinner, and Upstairs on the Square held a day-long fundraiser offering guests opportunities to dine and donate at breakfast, lunch and dinner. Our friends over at Drink offered an opportunity for charitable imbibing via a special menu of tropical cocktails made with Haiti’s famous Rhum Barbancourt, with a portion of proceeds going to Haiti relief. The list goes on an on, and we only hope it will grow. The enchantingly decrepit hotel also served as backdrop for Graham Greene’s novel, The Comedians. In his words, “You expected a witch to open the door to you or a maniac butler, with a bat dangling from the chandelier behind him.” The hotel’s “tropo-Gothic gingerbread façade” also inspired cartoonist Charles Addams, creator of the famed Addams Family. LUPEC loves a good story, and the Grand Hotel Oloffson is full of ’em, from tales of an eccentric owner who raised alligators in the hotel swimming pool to the American expat owner who fancied himself a Caribbean version of Rick from Casablanca (weapons scandal and all). Even as it fell into disrepair in the early ’80s, the Oloffson remained a destination for reporters and aid workers needing a safe place to stay near the heart of the city. Today, it’s where many American journalists are staying as they cover the earthquake that has devastated the country. LUPEC hopes to partner with member chapters in other cities in the coming weeks to prepare a fundraiser of our own, allowing you to sample some of Haiti’s fine alcoholic heritage, from Rhum Barbancourt to cordials like Combier and Grand Marnier, which source bitter oranges from the tiny republic. Stay tuned for updates, and in the interim, enjoy one of these. Shake in an iced cocktail shaker. Strain into a goblet and fill with crushed ice. Serve with straws and garnish with twists of orange and lime. Our Tiki Bash is just a few short weeks away, and LUPEC Boston has assembled a class-act event. With hula instruction, burlesque dancers, ukulele-sensation Uke Springsteen reinterpreting “the Boss” on his tiny, tiny guitar, plus cocktail historian/Boston music legend Brother Cleve spinning records, this is an event you won’t want to miss. It wouldn’t be a LUPEC party if cocktails weren’t the main attraction. In the next few columns, we’ll offer a taste of what’s in store on November 14th to whet your appetite and introduce you to hallmarks of the tiki drinks that inspired the party, considered so delicious in their heyday, they begot a craze that outlasted every cocktail fad before and since. The Fog Cutter, one of two drinks we’ll serve at the LUPEC Boston Tiki Bash, is commonly credited to Trader Vic, though Ted “Dr. Cocktail” Haigh casts doubt upon these origins in Vintage Spirits & Forgotten Cocktails. Haigh traces the drink via expert barman Tony Ramos, an original bartender at Don the Beachcomber’s in Los Angeles, who recalls the Fog Cutter as the signature drink from Edna Earl’s Fog Cutter bar in LA. Regardless of who invented it, this potent combination of three unlikely bedfellows—rum, brandy and gin—plus fresh juice, orgeat and sherry—is a memorable beverage. Provided you don’t tipple too many, of course. If you’ve never heard of or tried orgeat, you’re in for a treat. Originally a health tonic popular among Romans, the early formula for orgeat was simply boiling water, barley and honey for several hours, then straining it (the word derives from the Latin “hordeata” meaning “made with barley”). In its modern incarnation, orgeat is a typically sweet, milky-looking almond syrup (who knows where the barley went?) made by boiling almonds and sugar and adding a little orange flower water or rosewater at the end. Shake all ingredients except sherry with ice cubes. Pour into 14-ounce glass. Add more ice cubes. Float 0.5 ounces of sherry on top. Serve with straws.